Last year, the weather for this race was FRIGID! This year was definitely better - the temp was in the high 60s, and the air was humid. I had originally decided to sit out on this race, but was glad that we ended up going. As I've said before, racing is really about more than just the course and the bike - it's also about being with friends and hanging out (much more fun than racing ;)). We pre-rode the course, and it was pretty much unchanged from the previous year. Uphill pavement start onto an uphill grass grind, downhill into some sweeping corners, a tight up/down chicane, more grass, a single barrier (I LOVE this! ), into some [mucky] woods, back over a single barrier, down a singletrack section of woods, onto an uphill sidewalk, more uphill and then a run-up (well, the guys were riding it, but for me it was a run) and back again. Despite the warm temps, it was windy, and this was going to play a factor - a good draft was going to help, and going it solo was going to hurt. Mike's race was first, and he had an AWESOME start, hitting the grass uphill third behind Curtis and Mark M. I watched proudly as he sat on Mark's wheel for the entire first lap - he looked great and was sitting between the McCormacks - not a bad place to be. As the leaders came through for the second lap, however, my heart sank some when I didn't see Mike. I waited, and waited. When I finally saw him, he yelled that he needed a wheel, and I took off for the pits. While I couldn't figure out what had happened, it turned out that he rolled his tubular at the bottom of the ride/run up, costing him his position in the race. Luckily, we had spare wheels in the pit, he changed it out, and was off to chase down the field as much as he could. 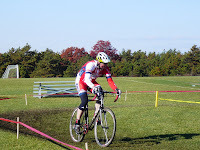 Wayne riding a great 45+ race; This guy finished well - on a Pugsley! I was up next. I didn't spend any time on the trainer getting warmed up though - given Mike's trouble, I waited in the pit for a couple of laps to be sure that he was all set. I did have to sprint a few times to get there though, and did some "hot laps" in the parking lot before the race. I did one more pre-ride of the course before we were off, and that was my warmup. That was ok with me - I don't like the trainer anyway ;). It was a good-sized field for the 1/2/3 women, and Kathy Sarvary was out for her first race since she broke her foot in September. I got to know Kathy last year, and spent some time with both she and Sue M before the race. I love both these women - they are great people and awesome racers (and Kathy is a current World Champion!). My goal for the race was to stick to the two of them - something I haven't been able to do in past races. On the whistle, Mo Bruno took off after the hole shot prime (she ended up winning by a pretty big margin). I had another great start (I think this is 3 or 4 in a row! ), and landed on Kathy's wheel going into the grass. As we headed uphill, most of the women chose to ride the pavement, but I made up time and places by riding the grass just to the left. I continued to move up in the first lap, passing Julie before the singletrack, and then saw that I had a gap behind and Sue and Kathy just ahead. I made a move to catch them at the run-up and called out that we had a gap and if we worked together, we could keep it. I moved to the front to take my pull, looked back, and none had moved with me! I later found out that it was too much of a move - I hadn't meant to drop them, but did. Kathy bridged up to me, and we rode together for the next part of the lap. It was music to my ears when Kathy said to me, "We'll work together, ok?". Over the barriers we went, and in an effort to stay on Kathy's wheel (we had a growing gap behind us), I got too close going up a short uphill, and slipped. Not only did I slip, but I also lost my footing completely, and went down. Sh*t! Kathy made the right move and went ahead, and now I was chasing. And I chased, and I chased. I just couldn't close the gap. With one lap to go, Kathy was still ahead, but Sue and Ilana B from MIT were working together to close the gap behind me. As they passed, I jumped to get on their wheels, but couldn't pull it off. I had burned too many matches on my own in the wind. Once again, I ended up finishing with Sue in sight just ahead, but as disappointed as I was with losing Kathy's wheel, I was pleased with how I raced overall - strong and determined, and this time (unlike in races past), I didn't mentally quit. 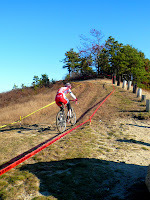 Last year, this was my favorite race course of the whole 'cross season. I had been looking forward to returning this year for awhile, foregoing Porky Gulch this year in favor of this race. I had even told Mike Keough, the promoter, how much I loved this course. Poor Mike, though, found out on Monday that there was going to be a problem - the high school Superbowl was going to be played at the same location on the same day! He was in a panic, but he, his boys, and all of the folks who put on the race did a great job of moving the course, and still making it one of my favorites (although I have since heard words like "heinous" and "brutal" used as descriptors...). When we arrived at the venue, Sam told us that he hoped we brought strong backs, small gears and good legs - the course was tough and there was a lot of climbing. We went out to see what the fuss was about, and sure enough, there were PLENTY of climbs on the course. Power climbs, but hills that took almost everything you had to get up and over. Add the wind on the upper fields, and this was going to be a very tough race. Despite that, I really liked the course - except for the barriers. It seemed they were in an awkward place (a slightly uphill approach into a vicious headwind left no ability to coast into them), and disrupted the flow of the course. We watched the Cat 4 women's race, and I was so excited to see THREE NEBC women in the top ten - Shannon added a 4th place to Saturday's second place finish, MTB'er Janet ended up 9th, and Kathy M had a stellar race, finishing 10th! Katherine, Karin, Jean and Julie all looked great as well, and I KNOW they had a good time - a couple of them went out for their final lap after the official noted that they had already raced for their 30 mins, and could be finished and placed if they wanted - they chose to ride out their laps instead! I spent time talking to Kathy and Sue before the race, and the three of us agreed to work together. It was windy, and working in a group was definitely going to be an advantage in this race. I confessed to Sue beforehand that my goal for the season, especially after Saturday, was to finish ahead of her in just one race ;). My start wasn't as good on Sunday, but I did quickly end up on Kathy's wheel - right where I wanted to be! Sue was ahead of us, but we chased her down as well, and now we were together. After the climb behind the stadium, we went through the mud and into the next tight section with a short uphill. Today, it was Kathy's turn to slip - she dismounted, I rode and ended up ahead of her. With Karen and Hannah just ahead of me, I worked to try to bridge to them, and built a gap between myself and Kathy, with Sue behind as well. Karen was off and I couldn't seem to catch her, but I did manage to connect with Hannah. The two of us worked together through the windy fields on one lap, which was awesome. As we came up the hill behind the stadium and into the mud, I saw Karen slide off of the line and off the course. I thought this would be a great place to take advantage, and to try to bridge and/or get by her. Unfortunately, I was so focused on Karen, that I did the EXACT same thing and slid off of the course. I yelled to Hannah to go, and got myself back on track. Well, Hannah went, and I was never able to bridge back up to her. With two laps to go, I could see that Kathy and Sue were now working together, and that I had to work to stay ahead of them. I tried to focus on the race ahead of me instead of the race behind. With one to go I still had a gap. I wanted this BAD. The whole lap, I talked to myself, "Ride it like you mean it", "You need to clean this", "C'mon, c'mon, c'mon! ", "Fast, fast, fast", "Not today! ", and the best one of all, "If you finish ahead of them you can retire!". With my HR pegged, and my back screaming from all of the climbing, I put my head down and drilled the last lap. It was full on TT mode - sprinting out of corners and off of the climbs, pedaling through all of the corners. I could see them behind me, but managed to stay ahead through the finish! I literally had to stop as quickly as possible after the race for fear of falling over and/or throwing up. I couldn't breathe, and everything hurt. Signs of a good race, right? I ended up finishing 7th, but felt like I had just won. I was really excited about my weekend of racing - maybe some time off the bike is a good thing? Oh, and Sue and Kathy are urging me not to retire just yet ;). Kathy is looking to come back on form after lots of time off from 'cross, gearing up for Natz and maybe even Worlds again to defend her title, and told me to watch out. That was only a very small part of it. We had the entire back yard setup with a loop that had no less than 15 hairpin turns. Alas, they came and took our course away at lunch. Great race reports! Good on you for going all out (and not throwing up at the end...classy).